With another year of successful updates under their belt, Warframe developer Digital Extremes held another community-focused, charity-driven convention like last year in the laid-back city of London, Ontario. TennoCon 2018 took place on a warm, sunny July 7th, and was full of plenty of huge reveals that are sure to elicit strong reactions from Warframe’s worldwide audience. We have our impressions fresh from the event available for your perusal below. The demo began with a surprisingly catchy song, chanted by Corpus-looking workers. Turns out, these are laborers who have modified their bodies with biomechanical upgrades. Problem is, these enhancements are so expensive, many (perhaps most) of the laborers are effectively indentured servants, working long hours to pay off a small fraction of their debt. The newly introduced Solaris United faction fights Nef Anyo, the ruthless Corpus ruler of the underground Debt-Internment Colony of Fortuna who doesn’t blink when killing those who default on their payments. An all-new, extra large playground of a map was revealed, called The Orb Vallis. Situated in a rocky Venusian (as in, on the hellish planet Venus) outcrop, a looming central tower constantly spews out an artificial environment, in order to make the surface of Venus hospitable. This tower is so good at it, in fact, that the landscape is covered in snow, in stark contrast to the Plains of Eidolon expansion, with its more temperate climate. Speaking of which, the entire Eidolon map can easily fit within the base of this new map – Fortuna is approximately twice the size of it. What’s there to do in this new massive map? Plenty of activities await any eager Tenno who venture into these frozen lands. Bounties, or quests given out by NPCs, make a return in Fortuna, but this time around, turning in the bounty for rewards can be done mid-level, as an NPC can be found to both start and finish new bounties. This is a new change to the bounty system, brought about due to direct player feedback, which Digital Extremes receives a lot of. 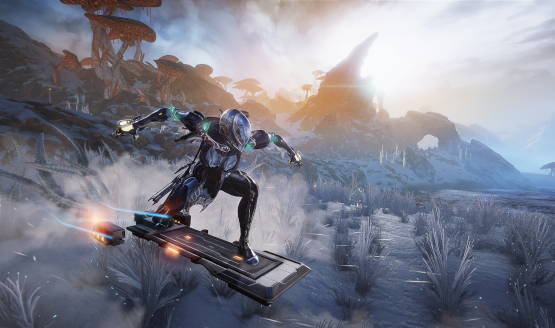 A new method of transportation has been introduced, the hoverboard, or Bondi K-Drive as it was called in the demo. Not only is it a heck of a lot faster than even the fastest Warframe, tricks can also be performed while in mid-air. However, these hoverboards are not some piece of exclusive Warframe technology – enemies can and will use them in battle, too. As this is an open-world map, Archwings (essentially jetpacks) can still be used. So, squads could potentially counter the raw speed of the hoverboards with the increased visibility and range afforded when one increases altitude. One caveat with hoverboards is that you cannot currently use weapons while on one. This is an issue that is still actively being debated by Digital Extremes. Creative Director Steve Sinclair is in the “no shooting” camp, because he believes that once you shoot from a hoverboard, you’ll never fire weapons any other way. It’s an interesting dilemma, but regardless, the hoverboards are an impressive new vehicle to get around in. Want more? The Plains of Eidolon introduced some pastime activities, such as fishing and making custom melee weapons. In Fortuna, modular weapons (as in, projectile-firing) can now be created, and wildlife can be tracked, lured, and relocated via tranquilizer and drone that whisks the animal away, Metal Gear Solid V style, to a safe spot as part of a conservation effort. Luring the animals involves using an echo lure, which mimics the mating calls of particular animals. If the target animal responds to the player’s initial call, their answer must be replied to by altering the pitch of the lure, currently by looking up or down while using the lure. Want even more? Digital Extremes is seemingly always happy to oblige. Presumably some time after Fortuna drops, another update has already been detailed. Currently dubbed Codename: Railjack, this update was demoed immediately following the Fortuna demo. In Railjack, the usual squad of up to four players is tasked with completing a mission in space. Don’t go thinking this is an Archwing mission, though. Instead, these Railjack missions combine all major aspects of the, until now, disparate mission types that have been available in Warframe. First, players are picked up from Venus in a new type of ship – all players, in one ship. Next, the ship seamlessly transitions from the bitter cold of Venus’ modified atmosphere, through its regular, brutally heated stratosphere, and finally into the frozen vacuum of space. Once in space, one player can pilot the ship in a freeform area. Naturally, the surrounding territory becomes hostile to the Tenno’s presence. All players can man a gun, while one pilots and shoots. 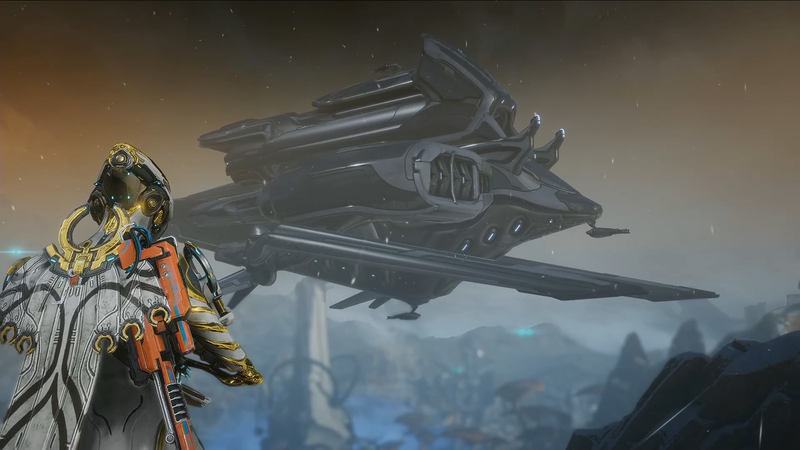 Warframe becomes a space combat flight simulator at this point, because the ship can have power redirected to boost its shields, weapons, or other settings. The enemy can even board the ship, and must be dealt with in the middle of the battle. Fires can also break out on the deck, which is never a good thing. Those fires must be dealt with via fire extinguisher, as well. Once the squad is close enough to a capital ship, some or all players can launch out via Archwing, in order to board. However, if one Tenno stays behind, they can remotely hack into various electronics onboard the enemy’s capital ship, and thus turn turrets against their masters, disable, shields, and more. Any Tenno onboard the enemy’s ships will play through the usual procedurally-generated maps that Warframe is famous for. Railjack really ties everything together, and engages players in a way that helps to make sense of the wild variety of missions on offer in Warframe. Fortuna, meanwhile, is a massive, promising world within Warframe that shows a development team that has learned plenty about what does and does not work, but this is also a development team emboldened by constantly reaching out its fans and taking an occasional chance. Finally, although information on The New War is scant, fans have been clamoring for any sort of conclusion to the cliffhanger ending of the last quest, The Sacrifice, so seeing evidence of progress on that front is also a good thing. It’s an exciting time to be a Warframe fan, and for those who have yet to check the game out, it’s an equally exciting time to give it a shot. Ninjas play free, after all. Oh, right. Warframe will also launch on the Nintendo Switch, with development assistance from Panic Button, who has ported DOOM, Wolfenstein: The New Colossus, and Rocket League to the system. There are also currently no release dates for any of the above-mentioned updates, as they are still deep in active development. While you wait, keep it locked here for more Warframe news as we receive it!